This stop on our Kimberley trek was the one I was looking forward to the most and it did not disappoint. For Mr. it was Kooljaman – Cape Leveque, for me it was the Bungle Bungles. I had one misconception about our Kimberley trek, I thought it would be flat and so far it hasn’t been at all. From Halls Creek we started seeing hills, mountains and ranges. 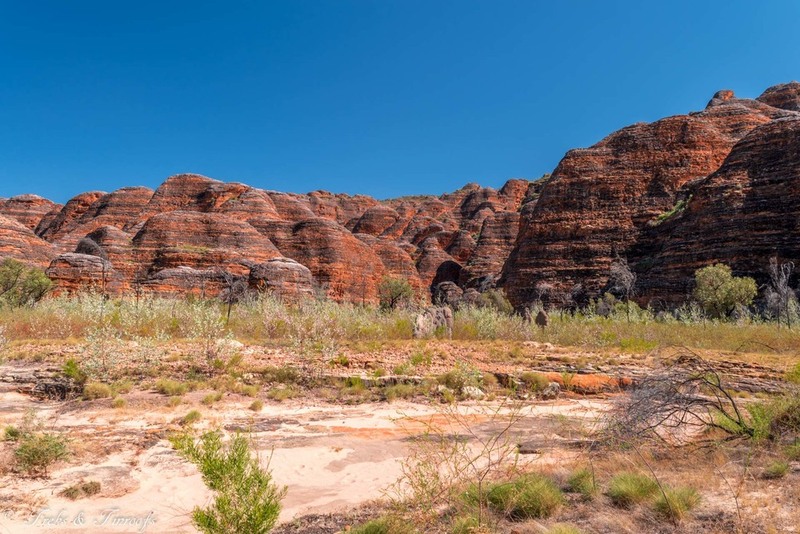 The drive into Purnululu has you weaving your way up, down and around through the Osmand Ranges. I can’t believe we never read or were told anything about this amazing area surrounding the Bungle Bungles. When you tell people you are heading into Purnululu the first thing that normally comes out of their mouth is the condition of the road. For most it is horror stories or corrugations and losing or breaking bits of the car along the journey. The Park entry is 53km from the highway and in parts it was as everyone had described, although a lot drier along the many river and creek crossings. What I never heard was how beautiful the drive in was; or the sheer scale of the Bungle Bungle range or how impressive they are. After the first 20km of corrugations I thought damn, everyone was right and we were in for a long and slow drive. But for us, after the first section it was pretty much smooth sailing, not to say at parts you could cruise in a 2wd, but it was definitely easier and took 2hrs to reach camp. We unfortunately had to take a day off our original 3 day adventure because of the broken part on the car. The two nights were spent at Walardi camp and it was very well set up. It felt very private and we picked a spot where no one else was camping and had its own long drop (luxury). Purnululu has limited facilities; if you want drinking water, you must either bring it in yourself or boil the water provided. There are no showers, and the toilets are long drops – but are very well set up when it comes to long drops. It is recommended by park staff to walk Cathedral Gorge and the Dome loop in the morning as the light is better and half of the walk was in the direct sun so it can get really hot! We set off early and arrived to start the walk just before 9 and it was already 30 degrees. The walk is about 1 ½ hours if you do both and I think it worth doing them both as the sheer scale of the domes is impressive. Staff recommend to do the Echidna chasm between 11-1 because the sun lights up the chasm. I wasn’t going to walk this one as it was so hot but by the time we got there I found the energy to get out of the air conditioning and onto the track. This one was actually my favourite and I’m so please that I did it, it’s almost a little oasis with palm trees everywhere, something I did not expect at all. 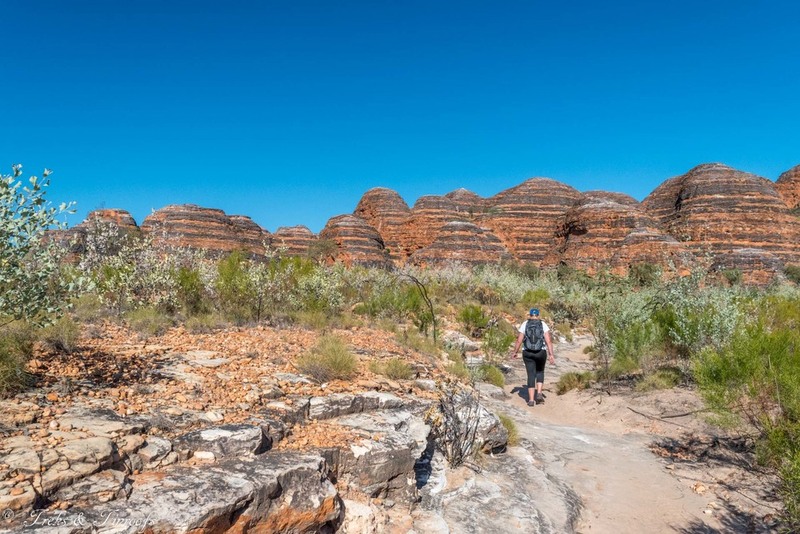 We made good time on both these walks so we managed to get back to camp and have a cool shower before our grand finale to the Bungle Bungles, a helicopter flight over the entire range. After jumping into the Microlight at Ningaloo I have a new found appreciation of seeing places from above, I’ve dropped a few hints to Mr. that maybe he should get me a drone. Seeing the range from above gives you a whole new perspective of the sheer scale of the bungle bungles. The first rock formation you fly over, Coalition Rock, is the same size as Ayers Rock, only 2/3 the height and it is dwarfed by the rest of the range. Over 45,000 hectares of rock formations and mountains! Best of all the vast majority unreachable and unseen by anyone, other than the local indigenous people, the cattle farmers that worked this land and those that fly over it. If you ever have the opportunity to fly over the Bungle Bungles, jump at it – DO IT. Heli Spirit, who we flew with also do scenic flights to here from Warmun (Turkey Creek) Roadhouse, Lake Argyle and Kununurra. Our final evening was spent watching Coalition Rock at sunset with another couple from Perth, refreshing not grey nomads (we say this because we haven’t seen many other young people on the road), in their own Pajero. We chatted into the night watching the last light disappear and the Milky Way form pretending we knew something about astrology. Thanks to Google Sky Map app we found Mars, Saturn, and Jupiter and a whole heap of other constellations we’ve never heard of. This was an amazing and unexpected way to close such a highly anticipated leg of our trek. This post was surprisingly difficult to write, I didn’t want to just ramble (I’m good at that) I really wanted to do this location justice. I didn’t know how to articulate how all my expectations of this place was exceeded, because they justly were! Without a doubt this has to be in my top 5 places I’ve ever visited and it truly left me speechless. Each location on this trek has surprised me in many different ways, Lake Argyle is our next stop and looking forward to an abundance of water and the infinity pool! It might be a while until we can post again so prepared to be inundated then.